President Obiang of Equatorial Guinea met with Nobel Prize Winner Luc Montagnier on November 26, after the two met at the inauguration of the Center of Francophonie in Bata. 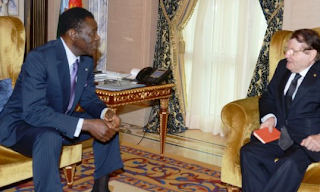 President Obiang discussed health issues with the French virologist, professor and doctor who led the first team that discovered the AIDS virus in 1983. In addition, they also talked about the “Leopold Sedar Senghor” Center of Francophonie, which officially opened last Tuesday.